Living in a city that gets more than double the number of tourists as residents yearly, there’s a big industry that caters to tourists. The number one question I get is where to eat in Marrakech. It makes sense. Whenever we’re out we see hundreds of them walking, eating, and enjoying the city. But, sometimes – ok lots of times – we cringe when we see what they’re eating. This post isn’t meant to say scare people – don’t be. But after saying too many times in my head “oh, you really don’t want to eat that,” I knew we had to do something! 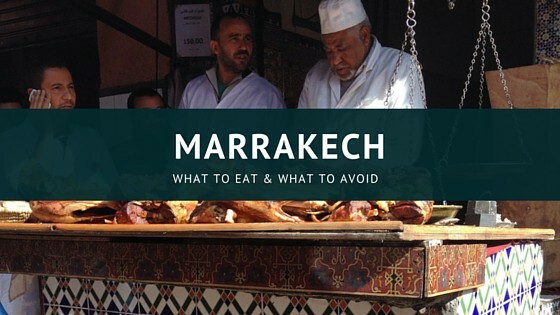 So here’s what to eat, and how to plan a culinary travel adventure when you visit Marrakech. People walk away from Morocco and think one of two things about the food. Besides palates what makes the difference? My dad came here ten years ago and we took a pre-arranged tour. We ate chicken and potato tajine almost daily for 10 days – and it wasn’t even that good. So, let’s get the negatives out of the way first. Do not buy cookies from carts in Djem al Fna. They might look good but the quality isn’t the same the ingredients, well who knows. Instead stick to patisseries. Patisserie Prince just off the square has really good cookies and pastries plus a nice interior sitting area to enjoy a treat without being hassled. Likewise most of restaurants in the immediate square area are not that good. They’re not dangerous to eat but they don’t have the same care and attention paid. Opt for a pizza or other non-traditional Moroccan food or risk being disappointed with your meal. Be careful eating at the food stalls in Djem al Fna. Almost every single article I read about food in Marrakech touts the open air food stalls in the square. But, there are only a few that you’ll see Moroccans eating at. Look for the ones that have many Moroccan families eating. If all you see is tourists, keep your distance. We realize many people want to have this experience and so we’ve been researching the best stalls – see below. Street food vendors selling fried fish. Marrakech is land locked so it takes some effort to get seafood here. Fried fish, french fries, and other fried treats are sold in street vendor stalls. I would encourage you to avoid all fried fish that you didn’t see how it started (freshness). Any fried foods you’re buying make sure to check the oil first. Just a peek is all you need, and it’s usually in plain view. If it looks dark colored or that it’s been in use for awhile- keep walking. Ground beef can be iffy. Make sure any that you eat is cooked well – no rare or medium rare meat is advised. Just because it’s expensive or fancy doesn’t make it good. There’s some really amazing high class food here, and there’s some really pretentious places that have mediocre food. Don’t take a high price as equating high quality. 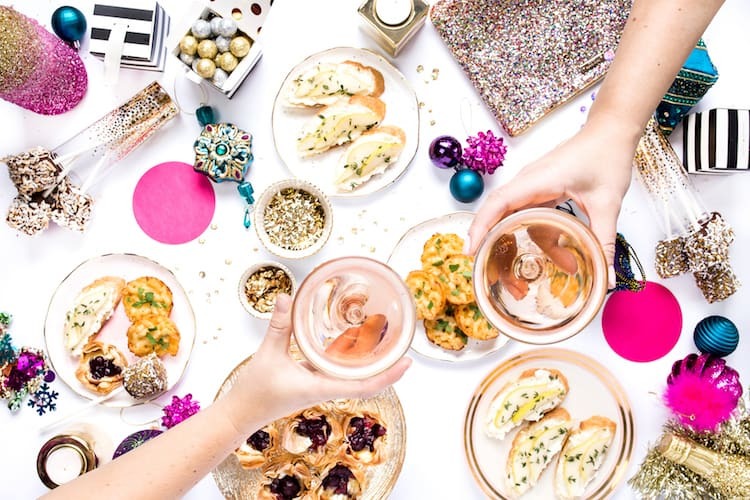 If you’re lucky, then you are coming to visit friends who will hook you up with some amazing eats. If you’re not, I’m going to share where we like to eat in hopes that you’ll enjoy it too. We rarely go out for breakfast, not because I don’t like to but because typically it’s either something quick at home or eaten past the traditional breakfast hour. But, when we do go out we love this place. Spoiler alert it’s not traditional Moroccan breakfast. If you’re looking for breakfast in Marrakech consider visiting. This restaurant has a 1950’s American dinner theme but the food is a mix of American and European flair. They do serve food all day but we love their breakfast. 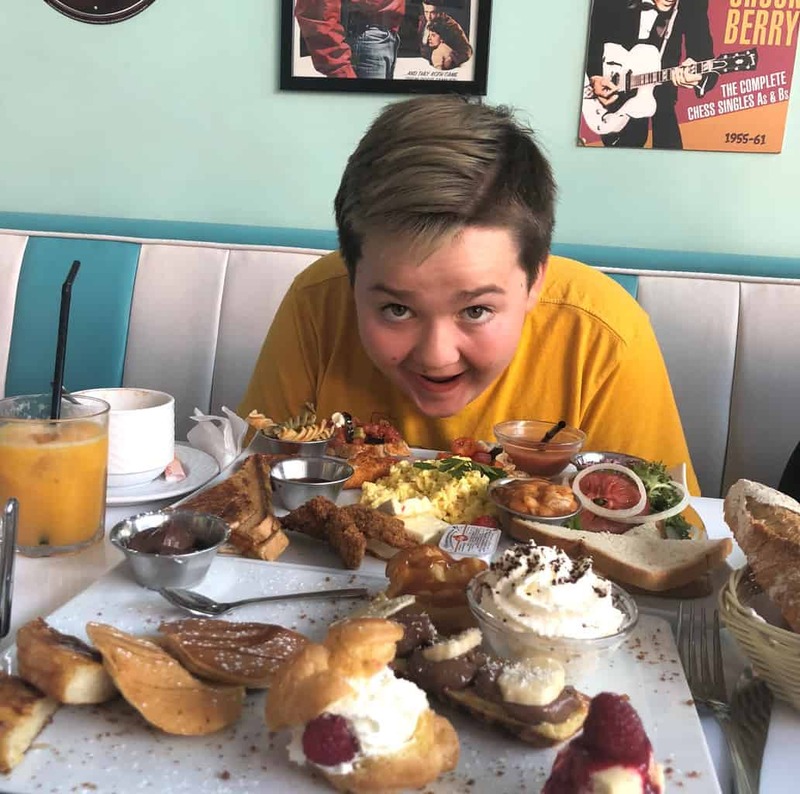 Pancakes, waffles, eggs and HUGE breakfast plates are a few of the things on the menu. It’s one of our kid’s favorite places too. Expect big crowds nearly every morning for breakfast but if you come early your chances of grabbing one of the handful of seats is better. The menu here is really simple. You can order the beldi breakfast which is fresh batbout bread with the above condiments; honey, olive oil, argan oil, honey, and amalou as well as olives. You also can get khlii with eggs. Khlii is Morocco’s famous dried meat that’s packed in fat and then melted down along with fresh eggs. It’s something you should try! To drink choose from Moroccan tea of a Moroccan smoothie with your choice of seasonal fruit. Located in the Marrakech Plaza, between Djem al Fna and Gueleiz is Cafe 16. I like this cafe because it offers simple foods that lack quality elsewhere. My favorite items are their salads that remind me of salad in the United States. Plenty of lettuce and toppings plus good dressings. The menu changes seasonally. They are open for breakfast, lunch, and dinner. The price is a little more than you’d pay in a neighborhood cafe but you can enjoy a filling lunch for 100 dirham or less. This is the biggest meal of the day. Anytime between roughly 12 and 2pm people take lunch. Dinner is served later, much later. It could be anywhere from 7pm – 11pm. There’s usually a “coffee break” (goute) in between. So, where do we go? This is one of our favorite places to take guests that are visiting. The restaurants on this street almost all serve a variety of grilled meats along with sides and starters. Some have a more Middle Eastern feel than Moroccan. But, overall they’re packed full of Moroccans with few tourists in site. You pick and choose what you want. Feel free to add more as you go. You can also get specialties like grilled sheep liver and heart which may not be for everyone but they do it well. I love their lamb and chicken kebabs, stewed white beans, and tomato salad. This is one of my go to restaurants where I know I am guaranteed to have a great meal. There are a lot of options whether you eat meat or you’re a vegetarian. The menu is Lebanese/Syrian inspired and you won’t find a tajine in sight. If you want to come for dinner, make sure to have reservations. Lunch is usually easier to find a table. When people ask me where to eat in the square I tend to balk. But I know it’s a huge draw, an exciting atmosphere and something to experience. Recently the government has installed hand washing stations, water stations for vendors and standard stalls and seating. I still stand by my opinion that there is better food to be found elsewhere. However, if you really want to have the experience I recommend Stall 93 or 31 for grilled foods and Stall 14 “Krita” (there’s also a stall right across the way that is part of this “franchise” for seafood. The owners of stall 14 also owns a seafood restaurant in Gueleiz. At either place you’ll get good seafood, cooked fast, and insanely affordable. 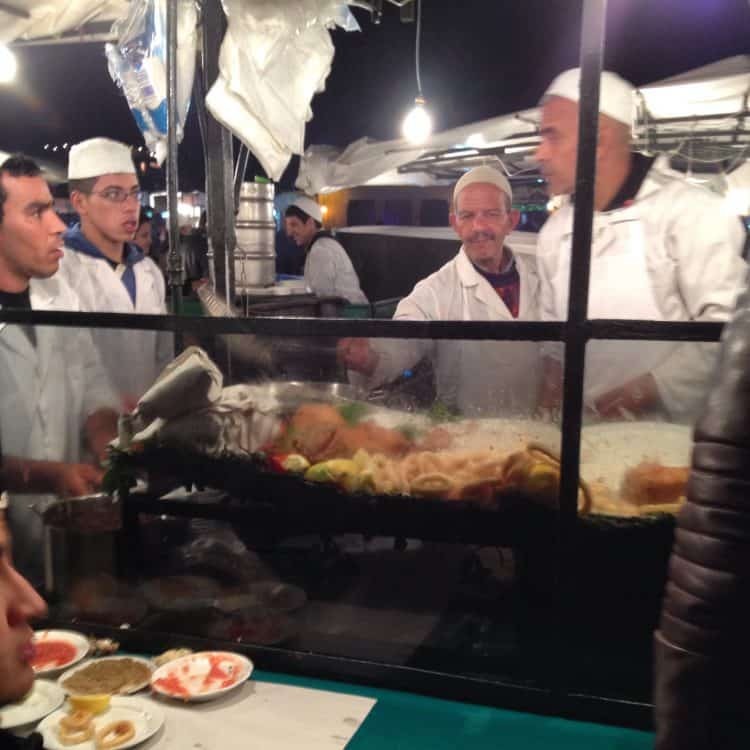 Tips to make your dining experience better – look for stalls with lots of Moroccans eating. 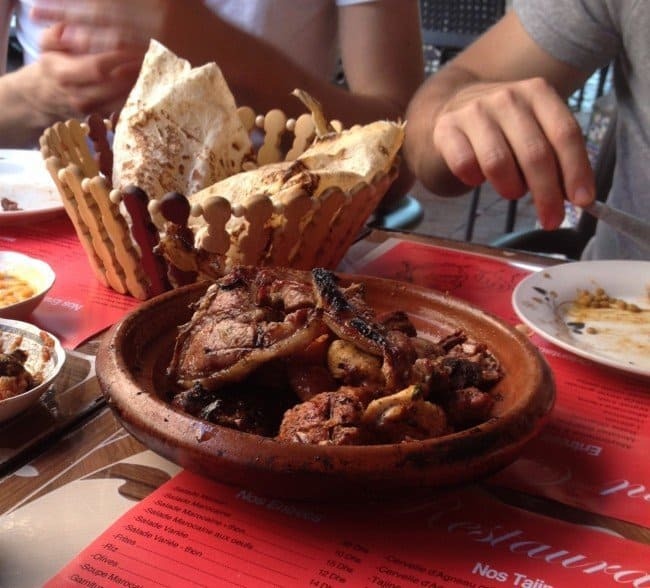 Stick with grilled foods – don’t go for tajine or couscous here. It’s very rare that I find any restaurants that really surprise me. But, the first time we ate here I was honestly very impressed. You will find several classic Moroccan dishes on the menu here that you’ll never find in another restaurant. There are also a few international dishes in case you’re tired of Moroccan. But, what I can say is that the flavors of real Moroccan cuisine are spot on in what they serve. I appreciate the subtle changes to appeal slightly more to a western palate (mostly including more textures in the dishes), while still remaining true to Moroccan flavors and traditions. We agree that some of the best food in the city is well hidden. It can be hard to find especially if you’re not sure what you’re looking for. 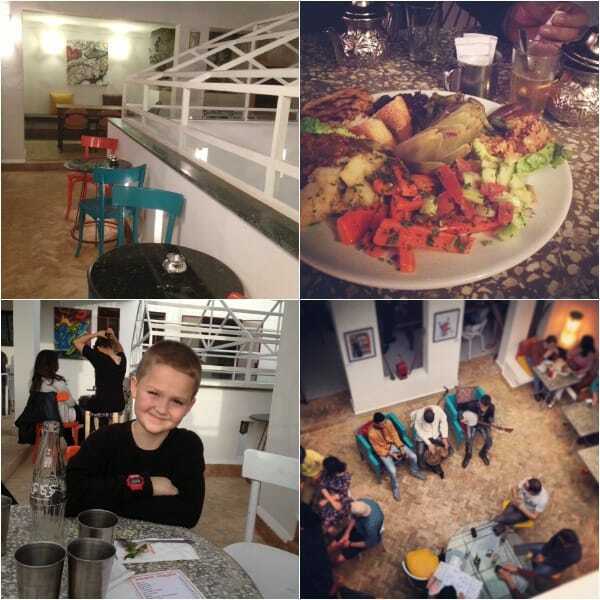 Last month we were invited to dinner at Ksar Essaoussan by some friends. The restaurant is so well hidden they have a man in a red cloak waiting at the nearest big street to help you find your way. It’s in a renovated riad that serves only as a restaurant – no on-site accommodations. Reservations should be made, but what you’ll find is a really great (dinner) meal of Moroccan food for a very reasonable price. Their small menu, which is more than enough, comes in around $35 per person for all courses and drinks. I’ve said it before and I’ll say it again. One of the best lunches to be had in the city is at the Amal Center. The quality is always reliable, and the cause couldn’t be better. Come for couscous on Friday but come early or make reservations because it’s increasingly popular not only with tourists but locals too. Their menu changes daily but there’s always options for vegetarians and always a mixture of authentic Moroccan and international food. Be sure to linger over a pot of tea and cookies. Cafe Clock, of Fez fame, has opened a new restaurant in Marrakech. The location is in the Kasbah – MarocBaba’s “home neighborhood” and we enjoy stopping in for the food as much as the memories. This restaurant is as much a cultural center as it is about the food. Thursday evenings play host to amateur storytellers who share the stories of Marrakech’s famed Djem al Fna storytellers BUT in English. Concerts, art displays, yoga classes, cooking classes – you name it and it’s probably happening here. They’re famous for their camel burger (yes real camel meat) but the menu really does offer something for everyone. 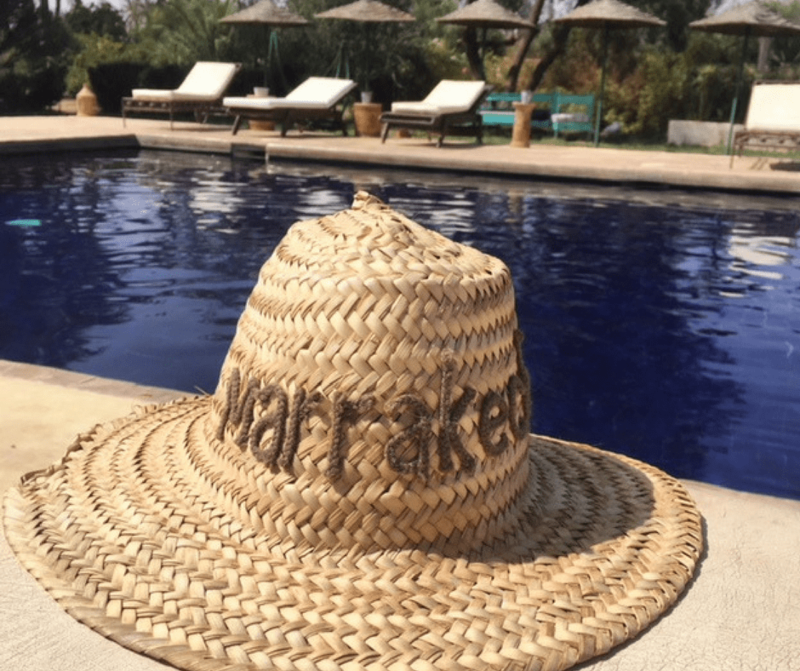 Can’t take a tour or want more help planning a food lovers trip to Marrakech? 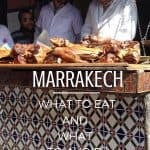 I’ve put together a guide that has over 50 of the best restaurants in Marrakech, insights on what to order and what you’ll find on menus and so much more. This PDF guide will help you take the guesswork out of dining and stop relying on TripAdvisor restaurant reviews to make your best guess on where to eat. 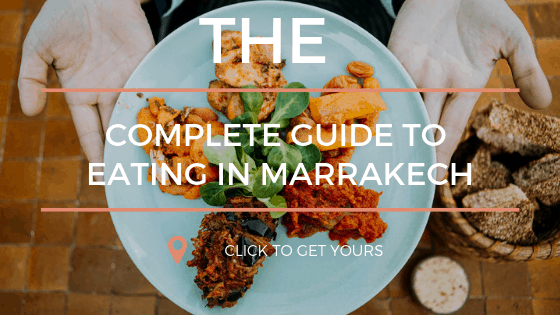 Grab your PDF copy of the complete guide to eating in Marrakech before you go! MarocBaba and I also offer walking food tours of even more great places! We have several different types of tours though our most popular is our evening walking street food tour. Our goal is to provide visitors with the opportunity to taste the real food of Marrakech, the kind that you would experience in someone’s home and not just the tourist version of Moroccan food. We have daily tours available and it’s conducted in English. You can find out more and book your tour by visiting our website Marrakech Food Tours. If riding a camel is on your travel bucket list when you come to Marrakech and Morocco, you won’t need to travel far out of the city to do so. Usually an animal synonymous with the sensory sand-dune adventures of the Sahara, or along the beaches of Essaouira, you can experience a 1-hour camel ride within 30 minutes of the City. 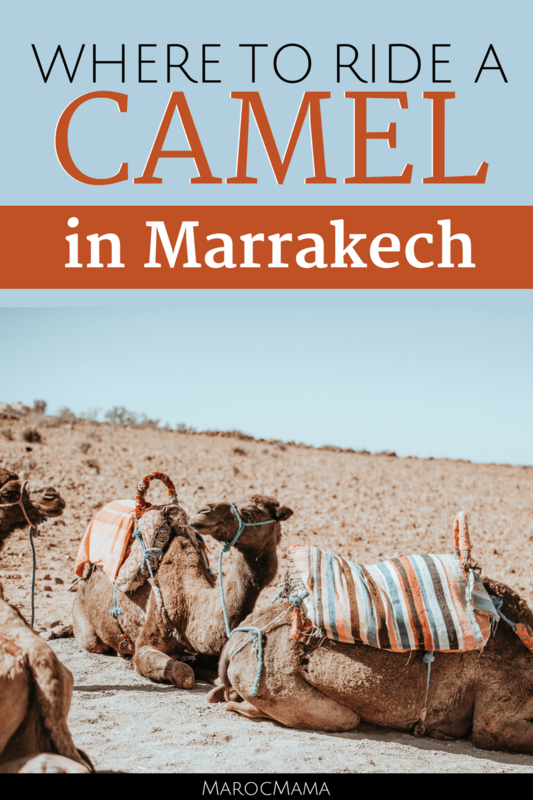 You’re unlikely to see the one-humped Arabian camel or dromedary wandering wild in the medina, or modern centre of Gueliz, although stranger things have happened! Their preferred habit is arid, desert vegetation. They’ve not herded together in the wild here, for nearly 2,000 years and were first domesticated about 4,000 years ago. There are a range of experiences you can try depending on your travel schedule, budget and your fitness levels. You can book a camel ride in advance with travel agents and tour providers who specialise in camel tours, or, you can travel to the two main areas where camel trips are organised, and choose which guide to try. The duration of the ride you want, and whether you’d like to combine the experience with a desire other areas can determine the experience. Although you can have a 5-minute or up to 2 hour experience, most tourists say a 1-hour trip is long enough without getting saddle-sore! Surprisingly, there is a small herd of camels basking in the sun outside Menara Gardens and Menara Mall. Although not possible to book in advance, you’ll find a local guide offering 5-minute walk arounds for anything starting from 100DH unless you are skilled to barter the price down. Keep in mind that the less you pay, the less money may be allocated to feed and care for the animals. The majority of camel rides take place in the Palmeraie or Palm Grove. You can reach there easily via taxi or horse-drawn cart from either Jamaa el-Fna Square or the area of Majorelle (taxis and caleche are located nearest to the Koutabia, or at the end of Rue Yves Saint-Laurent). Most tour providers that you book in advance will ensure hotel transfers at the start and end of your tour. What are the benefits of booking a camel tour in advance? Although you see a small herd of camels outside the gates of Menara gardens and Menara mall, you may find it reassuring that certain tour providers can arrange hotel transfers, limited liability insurance to protect from possible accidents, and even mint tea with a local village. Being able to view the included services and tourist reviews on their site is likely to enhance a feeling of trust and safety. Seeing and paying a fixed price means you’ve no haggling with the local guide, and you’ll ensure you are paying a reasonably fair price. Compare a 5-minute experience haggled down from 100DH not booked in advance, to a 1 hour ride for $20 booked and paid online before you go. Not only is that helpful for you to budget and plan your day around the experience, but it means it contributes to the healthy upkeep of the camels too. How travelers can help camels in Morocco. Camels have been used as a means of transport for thousands of years and although this may be the first camel you’ve seen, your ride will certainly have seen hundreds of humans! They are very social animals and don’t be surprised if they go to blow in your face as that’s their form of greeting one another too. Safety-wise, camels are languid souls and are fairly safe to ride if you’re following the sitting and holding position correctly provided by your guide. Like all animals, they can act unpredictably under unusual circumstances, so always follow the rules of the ride. Depending on if you’ve chosen the short and sweet trip next to Menara or the longer tour that includes added food or travel experiences, even up to the Agafay Desert, or adding in quad-bike fun, the most you can expect is something unique. Not renowned for being the most comfortable of rides, the best thing on board your camel, is the heightened view and getting to imagine yourself transported into an Arabian story among palm groves or relatively dry lands and sands. Who can we book with? If you are looking to book a true desert experience with a great meal and camel ride check out our Marrakech Food Tour partner experiences in the Agafay Desert. 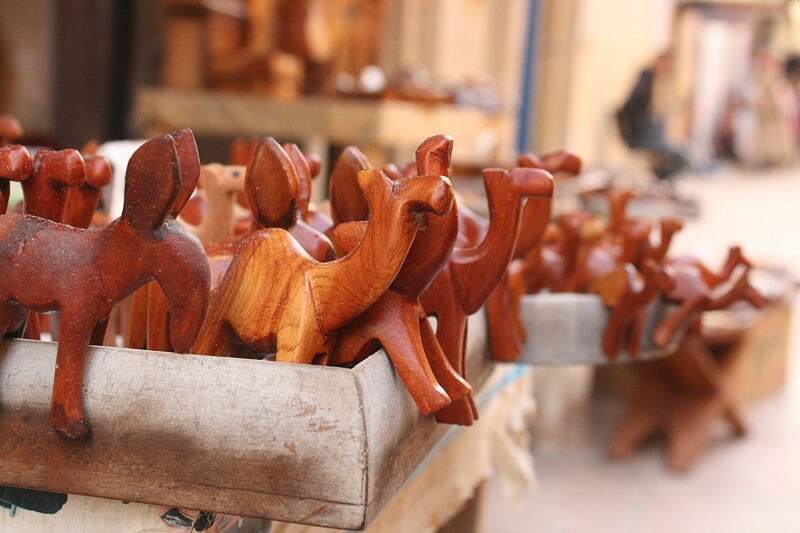 Depending on the time of year you’ll be in Marrakech there are different options available. You might also consider booking one of these tours that get great reviews! 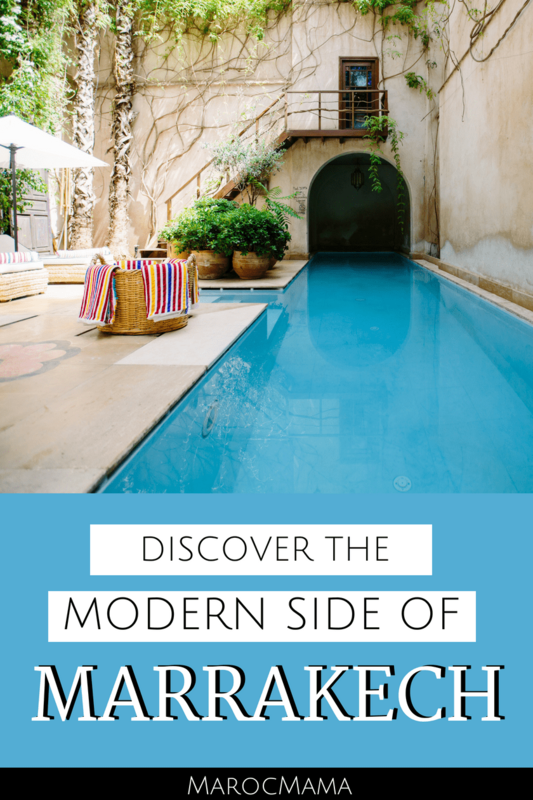 Marrakech has a layer of modernity that sits alongside the traditional scenes of the bustling souks and historical medinas ensuring it caters to all traveler tastes. For first time visitors, the contemporary map of Marrakech may not be your focus, while you head for the more iconic heritage places to visit. 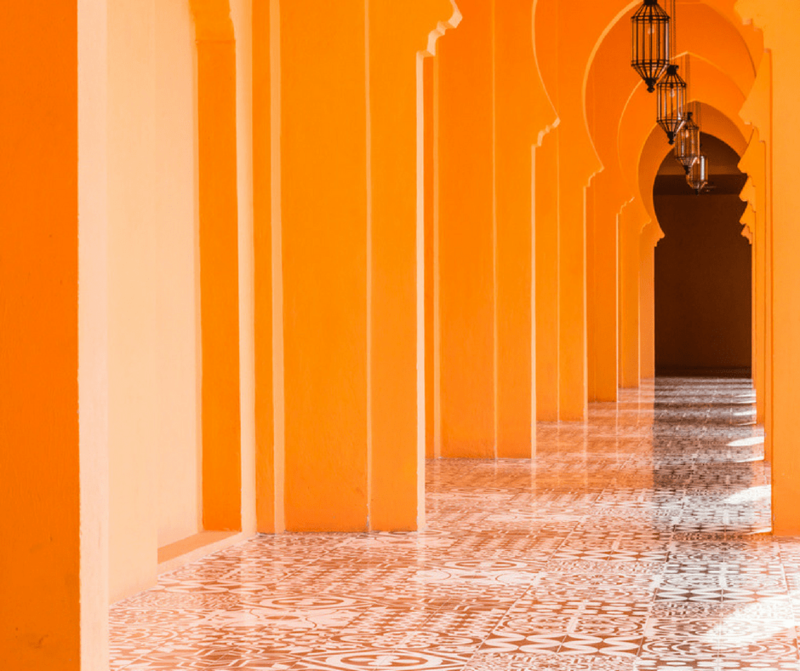 Return travelers, may find this modern side, the “new city of Marrakech” gives a fresh perspective, revealing a City that is thriving and attracting world-wide attention for art, design, travel and business development opportunities, and rising gastronomy cuisine. The majority of the contemporary scene is centered in the not so “new” town of Gueliz, founded in 1914. This area was once the French area of the city but today those lines of distinction no longer exist. You’ll spot popular international high-street chains such as Zara, H&M and even Starbucks. Due to an increasing rise in creative and entrepreneurial development, there’s a throng of new brands and businesses popping up across the new town and medina. Here’s a selection you might like to try depending on what you’d like to add to your travel itinerary. The YSL Museum in Marrakech recently was awarded the “Best New Public Building” design award from the British magazine Wallpaper*. Thousands of international visitors flock weekly o snap the beauty of the architecture by Studio KO as much as the YSL permanent collection. A rotation of contemporary artists are exhibited to keep things fresh. Currently showing Noureddine Amir’s innovative fashion running until 22 April. Musée MACMA or the Musée d’Art et de Culture à Marrakech is a surprising gem. Alongside Kaftan Queen boutique and the Yahya Gallery, it’s a peaceful art haven away from the bustle of Gueliz. Representing Moroccan artists like Hassan El Glaoui and Mahi Binebine, it offers a contrast to the traditional artisans in the medina. Museum of African Contemporary Art Al Maaden (Macaal) showcases the art of Morocco and its neighboring countries through different mediums. It has a strong education program celebrating African and international art. 33 Rue Majorelle curates the best of up and coming Moroccan and international brands produced in Morocco. Pick up quirky notebooks (a rare find in Marrakech), trendy fedora hats for men and women, contemporary jewelery, clothes for women and kids, lamps for design-lovers, and gorgeous smelling natural soaps, argan oils and home scents. Soufiane Zarib has an eye for juxtaposing traditional Berber carpets with contemporary interior design. 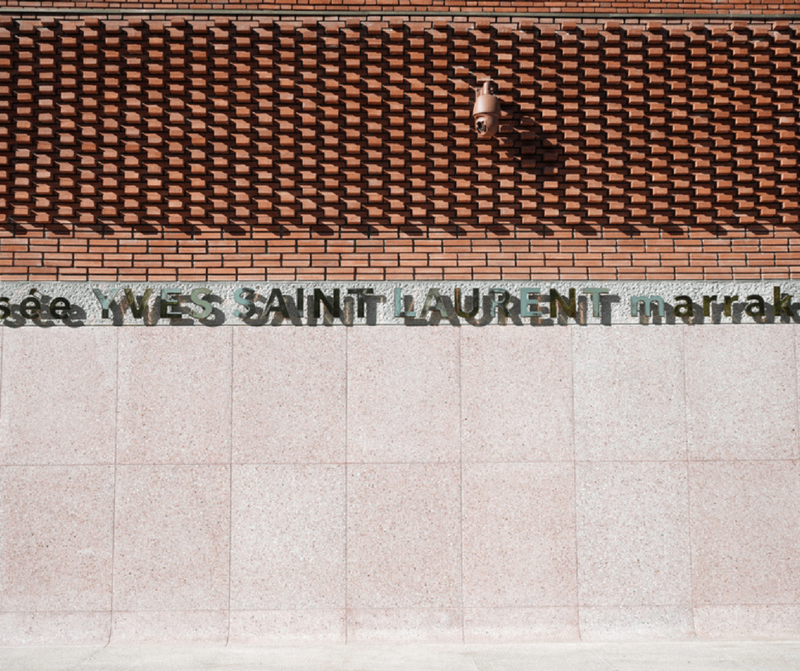 His shop facing the side of the YSL Museum is peaceful, giving you time to browse the impressive art and rugs. They even take the hassle out of shipping and exporting home for you. SOME Slow Concept Store was founded by @casabeldi & @nomcreation, two French designers based in Marrakech. 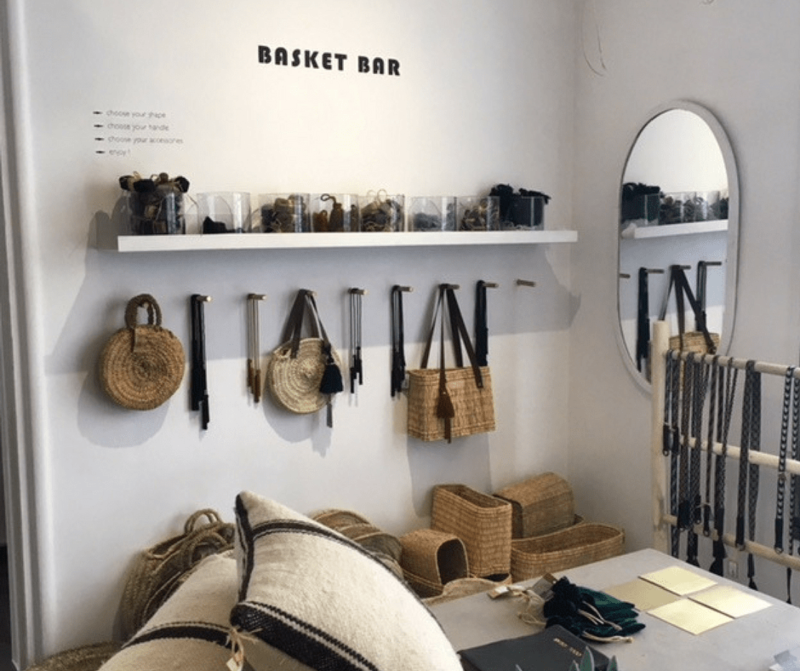 An airy sanctuary of well-curated contemporary craft, you can also shop for customizable raffia bags and satchels, and a modern twist on a classic Moroccan ceramic and glassware. On the mezzanine level, you’ll find a selection of artisana Berber rugs for the boho-chic home, and in the French-style kitchen, a range of carefully-chosen spices for the gourmet foodie. They’ve recently opened a small garden cafe, so why not take a rest under the orange trees for tea? Kaftan Queen, founded by British designer Sarah Rouach has opened a 2nd boutique in the mellah for medina fashion lovers growing from the popularity of her flagship Gueliz store. The classic yet contemporary womenswear and accessories brand is a trusted brand on the scene. Look out for the mesmerizing street scenes viewed from the window in the new store and the vintage furniture pieces (all Instagram worthy, for sure). Lalla boutique has a beautiful range of bags, purses and travel bags in a range of contemporary colours (check out the gold foil range in the Spring collection!) and fine-art jewellery. You can view the Designer at work in the glass-paned design space at the back of the store. LRNCE is the Belgian yet Marrakech-based designer, Laurence Leenaert who designs contemporary ceramics, textiles and leather accessories produced in Morocco. Most interior pieces are like works of art yet are equally functional for the home. A visit to her beautiful art studio is a must-see. Marrakshi Life was recently championed by esteemed designer Garance Doré of Atelier Doré. Their handwoven clothing made in Marrakech sells menswear and womenswear in tailored fabrics in contemporary, yet classic fashion styles. 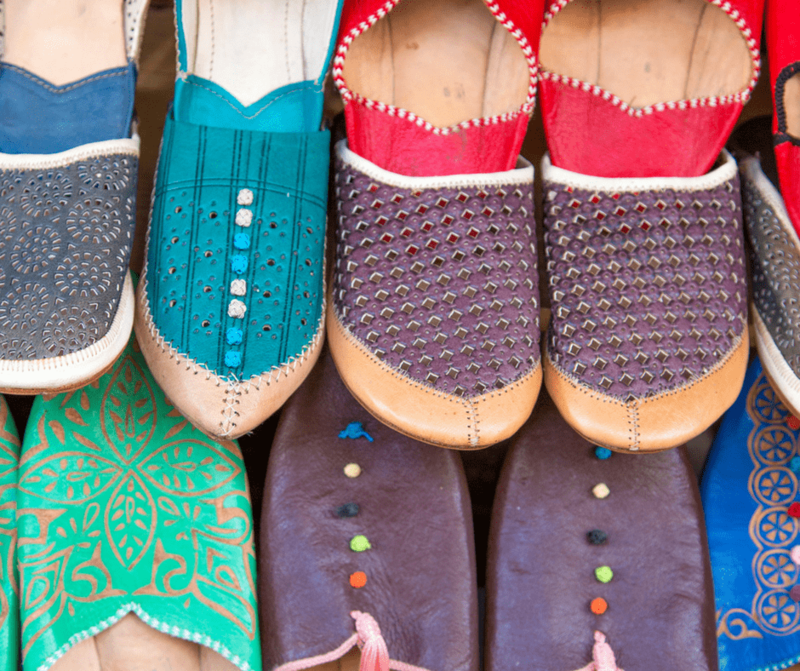 Long been THE spot to get great shoes Atika offers both local and western styles and designs. It’s well known and in a very visible location in Marrakech. Shoes are chic but not so expensive that you’ll blow your entire vacation budget on a single pair. This line of ceramic wear is a favorite of mine. With new designs that come out regularly you’ll be sure to always find something new on the shelves. The pieces are more expensive than you’ll find in the souks but are custom made for Chabi Chic and offer special patterns and pieces you won’t find elsewhere. Baromètre Marrakech is an alternative in the same region as Le Petit Cornichon, getting repeatedly good reviews for their fusion food and impressive cocktail menu designed by international mixologists. The Grand Café de la Poste still offers a contemporary, yet classic place in the Gueliz map, serving up fresh juices, or a cool beer, or choose from a wine-list that would satiate most wine-lovers. Early-evening, they have a complimentary canapés buffet if you get in quick enough! Marrakech Gastronomy offers cookery classes in the city where chef Driss Mellal will teach you modern Moroccan cuisine where the food is art on the plate. If you’re searching for an after-shopping or evening drink, you’ll find the international and Moroccan locals popping into Kechmara, Radisson Blu Lila bar, Entrepote, Point Bar or Café du Livre too. 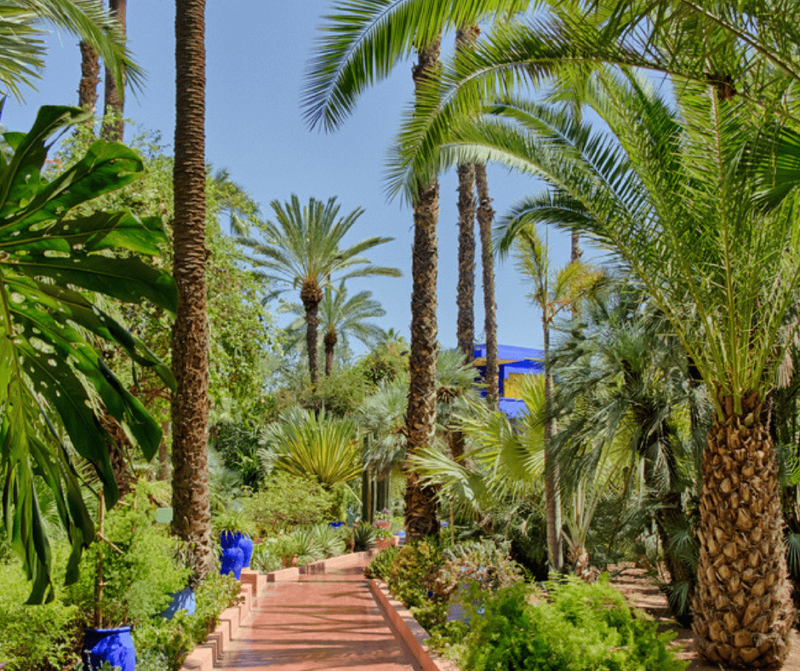 Héritage Berbère is nestled alongside Jardin Majorelle and sells a quality blend of his and her parfumes, colognes, candles and oils inspired by scents of Morocco. Caudalie spa is like a little oasis on Rue de Liberté. The staff are welcoming and knowledgeable about what range or treatment will suit your skincare needs. A welcome, luxurious beauty and spa break from shopping in the new town. Although often quiet, you’ll be free to browse without pressure. The Moroccans beauty brand was previously sold in the Lila concept store in Gueliz, but now has it’s very own boutique at the end of Rue Yves Saint-Laurent. It specialises in organic and fair trade argan oil cosmetics. 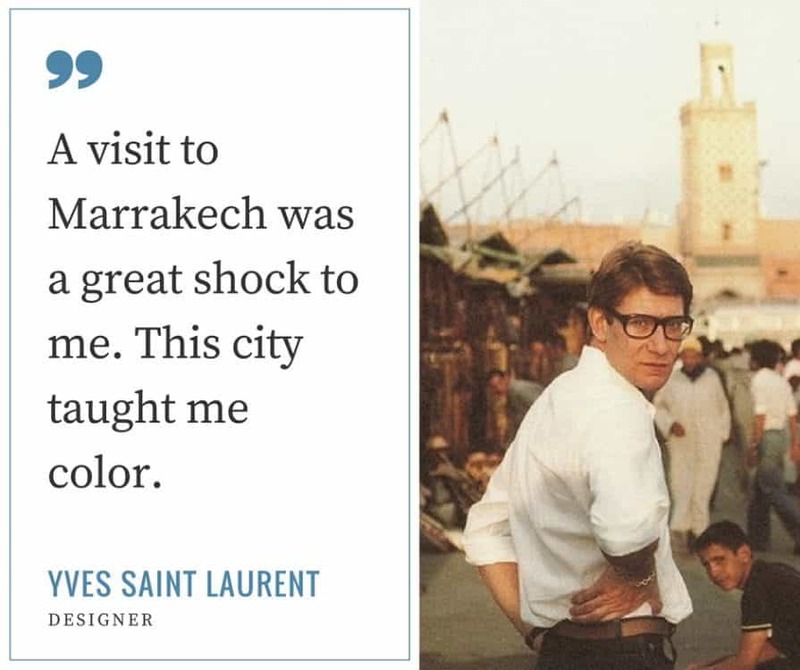 Pop in before or after you’ve queued for the YSL or Jardin Majorelle Museums. Located inside the lovely Movenpick Mansour Eddahbi in the Hivernage neighborhood of Marrakech this yoga studio is a great place to drop in and get a workout while visiting. Register to attend using their website where you can see multiple classes per day. Classes are held in French and English and the language is noted with the course. 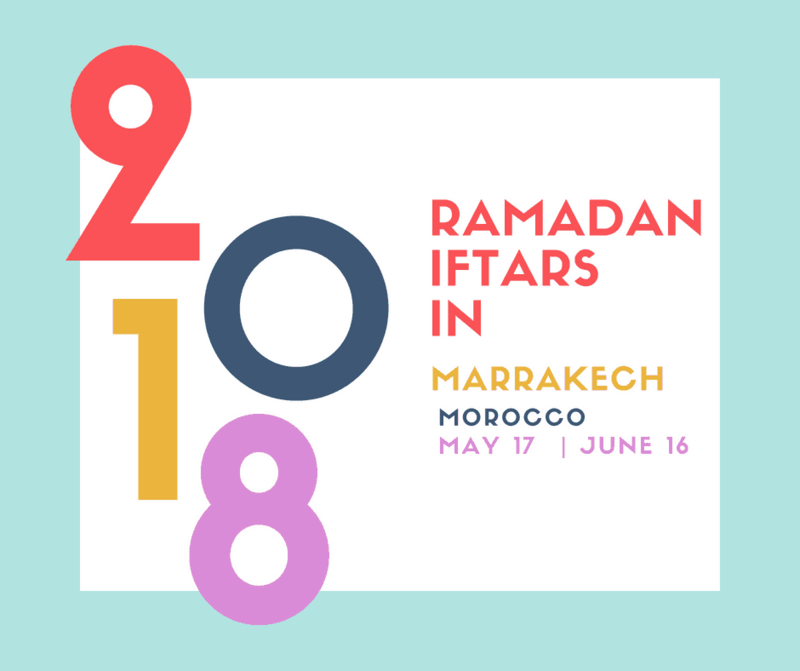 Morocco doesn’t have the same reputation of over the top Ramadan iftar (ftour) buffets as Dubai however more and more restaurants and hotels are offering iftars. 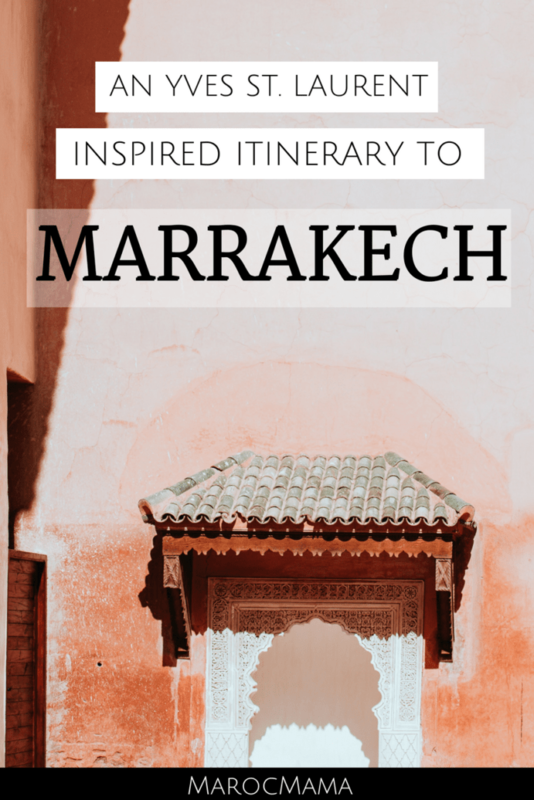 If you’re planning to travel to Marrakech during Ramadan and have no idea what I’m talking about, let me explain. At the end of the fasting day the meal is called the iftar (or ftour). There are traditional Moroccan foods eaten in homes. It’s often very difficult for visitors to experience what an iftar is all about. So, I decided to collect as many of the iftar meals being advertised in Marrakech so that they’re easy to find and join! I haven’t personally eaten at all of these places (though have at many) so please don’t consider this my endorsement – I simply wanted to offer a single place to find them. You’ll find a variety of price ranges and offers. When possible I’ve also left a little description. Argana – Located in Jemma el Fna an option for those staying nearby. Head to the upper levels for a good view with the sunset. Three menus available starting at 40dh per person. Cafe Clock – The cross-cultural cafe housed in the Kasbah neighborhood. They will offer a daily iftar buffet for 70 dh per person. The Amal Women’s Training Center and Restaurant– If you want the closest thing to an iftar at home, make sure to visit Amal in Gueliz. Nightly iftar opens at 1900. Unlimited buffet for 95dh. Reservations suggested. NewsCafe – In Gueliz located near the train station, NewsCafe has 6 different iftar menus nightly as well as an a la carte menu. They’re one of the only places I’ve found with a gluten free iftar menu. 29dh – 199dh per person. 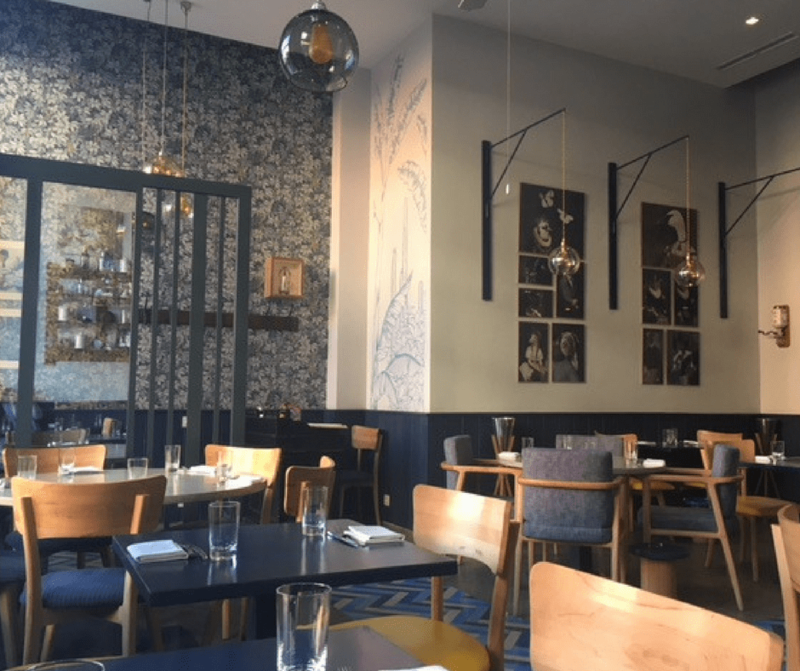 Le Bistrot Romain – This restaurant in Gueliz will have an iftar for 99dh per person. Cassanova – An Italian restaurant in Gueliz well known for it’s pizzas, they offered an iftar last Ramandan. No menu information yet. 100 dh per person. La Table du Marche – A great cafe in a few locations around Marrakech. The restaurant in Hivernage (320d pp), Menara Mall (160d pp) and near Carre Eden (100 d pp) will have iftar options. Le Maitres de Pan – Gueliz across from Victor Hugo. Moroccan iftar with pastries and full counter selection (extra). Base price from 50dh. Zushi Marrakech – Not a traditional iftar but offering a 30 piece sushi menu during Ramadan for 250dh. Located across from the Marrakech train station. Fairmont Royal Palm – Is on the outskirts of Marrakech and will have an iftar buffet open to residents and non residents. 400 dh per person. Le Grand Cafe de La Poste – For a Moroccan/French inspired iftar in a gorgeous colonial building head here. In Gueliz across from Zara. 340 dh per person. Royal Mansour – Join the staff at La Table for an iftar with live music. Sweet and savory offerings and a build your own crepe bar are on offer. 550dh per person. Movenpick Mansour Eddahbi – Nightly traditional iftar for 320dh per person. Four Seasons Marrakech – Join the staff from the Four Seasons nightly in their Azzera restaurant for an iftar buffet of traditional Moroccan foods. 390 dh per person. Full day pool pass + iftar also available for 800dh per person. Le Selman – Luxury hotel Le Selman will hold a ftour buffet nightly on their terrace with sweet and savory traditional Moroccan dishes. 390dh per person. They also have a pool pass + iftar for 690dh. Palmeraie Palace – An evening buffet is available for 299dh per person with kids under 12 50% off. Palais Namaskar – This stunning hotel offers a Ramadan buffet as well as other special offers during Ramadan. 438dh per person. Marrakech Food Tours – offering Ramadan iftars in the Agafay desert via partner. More information and reserve online here. Know of other iftars happening? Leave me a comment so I can update the list!